When I was twenty, a college friend invited me to a training program led by a community of people in Philadelphia who were dedicating themselves to a highly-unconventional vocation--what they called "social change." Intrigued, I took the training program and was deeply moved by the integrity of the people and their vision of bettering society. It felt like a miracle--being at the right place at the right time and stumbling onto my life path. Two decades later, I remain animated by this vision of contributing to the common good. It continues to shape my work life, my giving, my investing, my spending, my voting, and my volunteer activities with neighborhood groups. 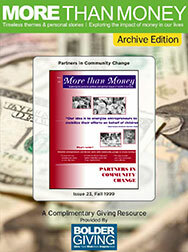 Now, as I muse on this issue of More than Money, I wonder what I can offer readers who haven't had "lucky" events helping them to get involved in social action. What if we wish to be inspired by the stories in this issue, but instead feel depressed, not knowing how to translate our desires into action? Formative Values: Learning from family, friends, and colleagues to appreciate the power of citizens to make a difference. Jumping In: Taking low cost, low risk, yet satisfying actions in order to begin involvement in civic action. Later, at important historic moments, accepting bigger risks offered. Community of Action: Connecting to networks of involvement. Developing friends who identify themselves as community workers; getting news and opinion unavailable in the mass media; and having role models who live their commitment and engagement. Learning. Reflecting deeply on one's moral, social, and political beliefs, and learning about current (or historic) social movements that have shaped our world. Identity. Claiming a lasting, principled role (e.g., "I'm an environmentalist"). We can use this model to examine our own lives. Which of these factors, if any, have played a role in our pasts? In our present lives, which factors are strong and which missing? Guided by such reflections, we can deliberately build into our daily lives those conditions that support more social commitment and effectiveness. For instance, I see that the program in Philadelphia gave me the middle three factors: a way to jump in, a community of activist friends, and systematic learning. Yet I floundered about for many years seeking a niche that fit my particular skills and personality, comparing myself harshly to "real activists" (who adored demonstrations, which only gave me headaches!). It wasn't until I developed #5, an identity as an educator on issues of wealth and stewardship, that I found my stride. By using this developmental model, we are able to see beyond the debilitating and prevailing myth about social engagement: that change happens because of the heroic activities of "rare" and "special" people like Gandhi, Martin Luther King, and Mother Teresa. Instead, we can begin to appreciate the thousands of ordinary citizens who create lasting changes by working together over decades. Take Rosa Parks, the woman who is credited with sparking the modern civil rights movement by refusing to give up her seat on a segregated bus in Montgomery, Alabama. Few people know that Parks had spent the prior 12 years helping to lead the local NAACP chapter, working with activists and studying past efforts for civil rights, including prior bus boycotts. She was able to take her well-publicized risky step precisely because it built on thousands of smaller steps she had already taken. We can all build our own capacity to engage in social action, based on our own unique strengths and gifts, by opening ourselves to the kinds of opportunities that McAdam says can nourish civic hearts and minds and souls. The adventure is in our next few steps, however we choose to take them.